What should I keep in mind about Child Car Seats? Note that people must be at least 150cm tall to sit in a seat with an inflatable airbag in front of it. Please find the attached brochures made by our government. An unborn child is well protected by a seat belt. The lower part of the belt should lie under the woman's belly. 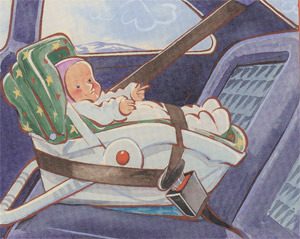 It is essential that the seat belt be fastened around the infant car seat according to the manufacturer's instructions. car which has inflatable airbags for the front seats. It is safest to put a child in forward facing car seats, in the rear of the car. 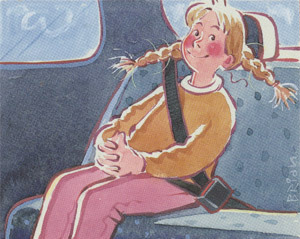 It is best to fasten the seat with a 3-point seat belt. least 15kg in order to use a booster seat. A booster seat with a back is required if there's no headrest. 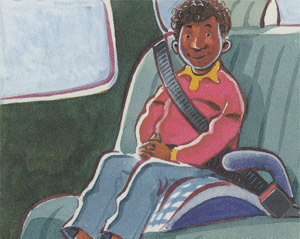 A child should only use a seat belt if it lies across the shoulder and thigh. 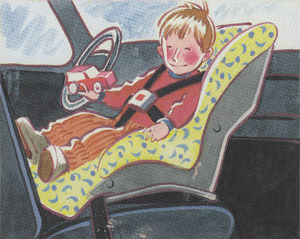 If the belt runs across the belly or rests on the neck, the child should sit in a booster seat. 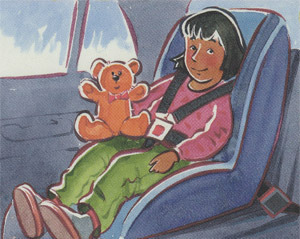 One must never put a seat belt under a child's arm or slide it behind the child's back.